Researchers from the Joint Physics Unit CNRS/Thales, the Nanosciences and Nanotechnologies Centre (CNRS/Université Paris Sud), in collaboration with American and Japanese researchers, have developed the world’s first artificial nano-neuron with the ability to recognise numbers spoken by different individuals. Just like the recent development of electronic synapses described in a Nature article, this electronic nano-neuron is a breakthrough in artificial intelligence and its potential applications. The latest artificial intelligence algorithms are able to recognise visual and vocal cues with high levels of performance. But running these programs on conventional computers uses 10,000 times more energy than the human brain. To reduce electricity consumption, a new type of computer is needed. It is inspired by the human brain and comprises vast numbers of miniaturised neurons and synapses. Until now, however, it had not been possible to produce a stable enough artificial nano-neuron which would process the information reliably. Today [Sept. 19, 2017 or July 27, 2017 when the paper was published in Nature? ]], for the first time, researchers have developed a nano-neuron with the ability to recognise numbers spoken by different individuals with 99.6% accuracy. This breakthrough relied on the use of an exceptionally stable magnetic oscillator. Each gyration of this nano-compass generates an electrical output, which effectively imitates the electrical impulses produced by biological neurons. In the next few years, these magnetic nano-neurons could be interconnected via artificial synapses, such as those recently developed, for real-time big data analytics and classification. The project is a collaborative initiative between fundamental research laboratories and applied research partners. The long-term goal is to produce extremely energy-efficient miniaturised chips with the intelligence needed to learn from and adapt to the constantly ever-changing and ambiguous situations of the real world. These electronic chips will have many practical applications, such as providing smart guidance to robots or autonomous vehicles, helping doctors in their diagnosis’ and improving medical prostheses. This project included researchers from the Joint Physics Unit CNRS/Thales, the AIST, the CNS-NIST, and the Nanosciences and Nanotechnologies Centre (CNRS/Université Paris-Sud). The French National Centre for Scientific Research is Europe’s largest public research institution. It produces knowledge for the benefit of society. With nearly 32,000 employees, a budget exceeding 3.2 billion euros in 2016, and offices throughout France, the CNRS is present in all scientific fields through its 1100 laboratories. With 21 Nobel laureates and 12 Fields Medal winners, the organization has a long tradition of excellence. It carries out research in mathematics, physics, information sciences and technologies, nuclear and particle physics, Earth sciences and astronomy, chemistry, biological sciences, the humanities and social sciences, engineering and the environment. To meet global demand for higher education, research and innovation, 19 of France’s most renowned establishments have joined together to form the Université Paris-Saclay. The new university provides world-class teaching and research opportunities, from undergraduate courses to graduate schools and doctoral programmes, across most disciplines including life and natural sciences as well as social sciences. With 9,000 masters students, 5,500 doctoral candidates, an equivalent number of engineering students and an extensive undergraduate population, some 65,000 people now study at member establishments. The CNST is a national user facility purposely designed to accelerate innovation in nanotechnology-based commerce. Its mission is to operate a national, shared resource for nanoscale fabrication and measurement and develop innovative nanoscale measurement and fabrication capabilities to support researchers from industry, academia, NIST and other government agencies in advancing nanoscale technology from discovery to production. The Center, located in the Advanced Measurement Laboratory Complex on NIST’s Gaithersburg, MD campus, disseminates new nanoscale measurement methods by incorporating them into facility operations, collaborating and partnering with others and providing international leadership in nanotechnology. Established on 1 June 2016, the Centre for Nanosciences and Nanotechnologies (C2N) was launched in the wake of the joint CNRS and Université Paris-Sud decision to merge and gather on the same campus site the Laboratory for Photonics and Nanostructures (LPN) and the Institut d’Electronique Fondamentale (IEF). Its location in the École Polytechnique district of the Paris-Saclay campus will be completed in 2017 while the new C2N buildings are under construction. The centre conducts research in material science, nanophotonics, nanoelectronics, nanobiotechnologies and microsystems, as well as in nanotechnologies. This entry was posted in electronics, nanotechnology and tagged (France) Centre for Nanoscience and Nanotechnology (C2N), (Japan) National Institute of Advanced Industrial Science and Technology, Akio Fukushima, artificial intelligence algorithms, artificial nano-neuron, biological neurons, Center for Nanoscale Science & Technology (Maryland, Centre National de la Recherche Scientifique (CNRS), Damien Querlioz, electronic synapses, Flavio Abreu Araujo, France, French National Centre for Scientific Research (CNRS), Guru Khalsa, Hitoshi Kubota, Jacob Torrejon, Japan, Julie Grollier, Kay Yakushiji, magnetic nano-neurons, magnetic oscillator, Mark D. Stiles, Mathieu Riou, memristor, Nanosciences and Nanotechnologies Centre (CNRS/Université Paris Sud), neuromorphic computing, Neuromorphic computing with nanoscale spintronic oscillators, neuromorphic engineering, Paolo Bortolotti, Shinji Yuasa, Sumito Tsunegi, Thales, Université Paris-Saclay, US, Vincent Cros, voice recognition, World Economic Forum on January 24, 2018 by Maryse de la Giroday. Enabling faster, smaller and ultra-low-power computers with memristors could have a big impact on embedded technologies, which enable Internet of Things (IoT), artificial intelligence, and portable healthcare sensing systems, says Dr. Baker Mohammad, Associate Professor of Electrical and Computer Engineering. Dr. Mohammad co-authored a book on memristor technologies, which has just been released by Springer, a leading global scientific publisher of books and journals, with Class of 2017 PhD graduate Heba Abunahla. The book, titled Memristor Technology: Synthesis and Modeling for Sensing and Security Applications, provides readers with a single-source guide to fabricate, characterize and model memristor devices for sensing applications. The pair also contributed to a paper on memristor research that was published in IEEE Transactions on Circuits and Systems I: Regular Papers earlier this month with Class of 2017 MSc graduate Muath Abu Lebdeh and Dr. Mahmoud Al-Qutayri, Professor of Electrical and Computer Engineering.PhD student Yasmin Halawani is also an active member of Dr. Mohammad’s research team. Conventional computers rely on energy and time-consuming processes to move information back and forth between the computer central processing unit (CPU) and the memory, which are separately located. A memristor, which is an electrical resistor that remembers how much current flows through it, can bridge the gap between computation and storage. Instead of fetching data from the memory and sending that data to the CPU where it is then processed, memristors have the potential to store and process data simultaneously. Logic gates control an electronics logical operation on one or more binary inputs and typically produce a single binary output. That is why they are at the heart of what makes a computer work, allowing a CPU to carry out a given set of instructions, which are received as electrical signals, using one or a combination of the seven basic logical operations: AND, OR, NOT, XOR, XNOR, NAND and NOR. The team’s latest work is aimed at advancing a memristor’s ability to perform a complex logic operation, known as the XNOR (Exclusive NOR) logic gate function, which is the most complex logic gate operation among the seven basic logic gates types. Designing memristive logic gates is difficult, as they require that each electrical input and output be in the form of electrical resistance rather than electrical voltage. “However, we were able to successfully design an XNOR logic gate prototype with a novel structure, by layering bipolar and unipolar memristor types in a novel heterogeneous structure, which led to a reduction in latency and energy consumption for a memristive XNOR logic circuit gate by 50% compared to state-of the art state full logic proposed by leading research institutes,” Dr. Mohammad revealed. The team’s current work builds on five years of research in the field of memristors, which is expected to reach a market value of US$384 million by 2025, according to a recent report from Research and Markets. Up to now, the team has fabricated and characterized several memristor prototypes, assessing how different design structures influence efficiency and inform potential applications. Some innovative memristor technology applications the team discovered include machine vision, radiation sensing and diabetes detection. Two patents have already been issued by the US Patents and Trademark Office (USPTO) for novel memristor designs invented by the team, with two additional patents pending. Their robust research efforts have also led to the publication of several papers on the technology in high impact journals, including The Journal of Physical Chemistry, Materials Chemistry and Physics, and IEEE TCAS. This strong technology base paved the way for undergraduate senior students Reem Aldahmani, Amani Alshkeili, and Reem Jassem Jaffar to build novel and efficient memristive sensing prototypes. The memristor research is also set to get an additional boost thanks to the new University merger, which Dr. Mohammad believes could help expedite the team’s research and development efforts through convenient and continuous access to the wider range of specialized facilities and tools the new university has on offer. The team’s prototype memristors are now in the laboratory prototype stage, and Dr. Mohammad plans to initiate discussions for internal partnership opportunities with the Khalifa University Robotics Institute, followed by external collaboration with leading semiconductor companies such as Abu Dhabi-owned GlobalFoundries, to accelerate the transfer of his team’s technology to the market. With initial positive findings and the promise of further development through the University’s enhanced portfolio of research facilities, this project is a perfect demonstration of how the Khalifa University of Science and Technology is pushing the envelope of electronics and semiconductor technologies to help transform Abu Dhabi into a high-tech hub for research and entrepreneurship. Slightly restating it from the press release, a memristor is a nanoscale electrical component which mimics neural plasticity. Memristor combines the word ‘memory’ with ‘resistor’. 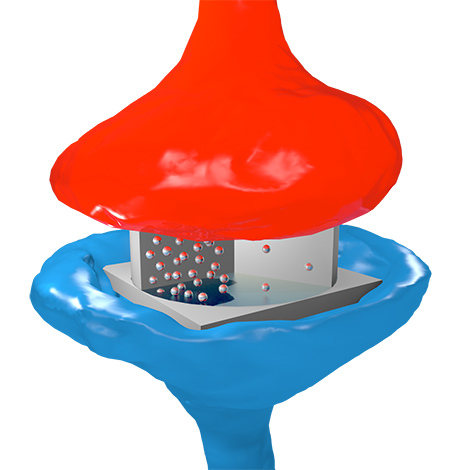 The memristor could lead to more energy-saving devices but much of the current (pun noted) interest lies in its similarity to neural plasticity and its potential application on neuromorphic engineering (brainlike computing). This entry was posted in electronics, nanotechnology and tagged Amani Alshkeili, artificial intelligence, Baker Mohammad, bipolar memristor types, brainlike computing, Changing synaptic connectivity with a memristor, computer circuits, Dr. Wei Lu and bio-inspired ‘memristor’ chips, Erica Solomon, GLOBALFOUNDRIES, Heba Abunahla, internet of things (IoT), Khalifa University of Science and Technology, logic gate design, Mahmoud Al-Qutayri, Masdar Institute, Masdar Institute of Science and Technology, memristor, Memristor Technology: Synthesis and Modeling for Sensing and Security Applications, memristors, Muath Abu Lebdeh, Neuristors and brainlike computing, neuromorphic computing, portable healthcare sensing systems, Predicting how a memristor functions, Reem Aldahmani, Reem Jassem Jaffar, sensing applications, The memristor as computing device, The memristor as the 'missing link' in bioelectronic medicine?, unipolar memristor types, United Arab Emirates, XNOR (Exclusive NOR) logic gate function, Yasmin Halawani on January 22, 2018 by Maryse de la Giroday. When you’re really harried, you probably feel like your head is brimful of chaos. You’re pretty close. Neuroscientists say your brain operates in a regime termed the “edge of chaos,” and it’s actually a good thing. It’s a state that allows for fast, efficient analog computation of the kind that can solve problems that grow vastly more difficult as they become bigger in size. The trouble is, if you’re trying to replicate that kind of chaotic computation with electronics, you need an element that both acts chaotically—how and when you want it to—and could scale up to form a big system. “No one had been able to show chaotic dynamics in a single scalable electronic device,” says Suhas Kumar, a researcher at Hewlett Packard Labs, in Palo Alto, Calif. Until now, that is. He, John Paul Strachan, and R. Stanley Williams recently reported in the journal Nature that a particular configuration of a certain type of memristor contains that seed of controlled chaos. What’s more, when they simulated wiring these up into a type of circuit called a Hopfield neural network, the circuit was capable of solving a ridiculously difficult problem—1,000 instances of the traveling salesman problem—at a rate of 10 trillion operations per second per watt. The device in question is called a Mott memristor. Memristors generally are devices that hold a memory, in the form of resistance, of the current that has flowed through them. The most familiar type is called resistive RAM (or ReRAM or RRAM, depending on who’s asking). Mott memristors have an added ability in that they can also reflect a temperature-driven change in resistance. The HP Labs team made their memristor from an 8-nanometer-thick layer of niobium dioxide (NbO2) sandwiched between two layers of titanium nitride. The bottom titanium nitride layer was in the form of a 70-nanometer wide pillar. “We showed that this type of memristor can generate chaotic and nonchaotic signals,” says Williams, who invented the memristor based on theory by Leon Chua. A micrograph shows the construction of a Mott memristor composed of an 8-nanometer-thick layer of niobium dioxide between two layers of titanium nitride. This entry was posted in electronics, nanotechnology, neuromorphic engineering and tagged brain, chaotic dynamics, Chaotic dynamics in nanoscale NbO2 Mott memristors for analogue computing, edge of chaos, Hewlett Packard Labs, Hopfield neural network, HP Labs, IEEE (Institute of Electrical and Electronics Engineers), John Paul Strachan, Leon Chua, memristor, Mott memristor, neuromorphic computing, neuromorphic engineering, neuroscience, niobium dioxide (NbO2), R. Stanley Williams, resistive RAM (ReRAM or RRAM), Stanley Williams, Suhas Kumar, titanium nitride, traveling salesman problem on January 3, 2018 by Maryse de la Giroday. Computing hardware is composed of a series of binary switches; they’re either on or off. The other piece of computational hardware we’re familiar with, the brain, doesn’t work anything like that. Rather than being on or off, individual neurons exhibit brief spikes of activity, and encode information in the pattern and timing of these spikes. The differences between the two have made it difficult to model neurons using computer hardware. In fact, the recent, successful generation of a flexible neural system required that each neuron be modeled separately in software in order to get the sort of spiking behavior real neurons display. But researchers may have figured out a way to create a chip that spikes. The people at HP labs who have been working on memristors have figured out a combination of memristors and capacitors that can create a spiking output pattern. Although these spikes appear to be more regular than the ones produced by actual neurons, it might be possible to create versions that are a bit more variable than this one. And, more significantly, it should be possible to fabricate them in large numbers, possibly right on a silicon chip. The key to making the devices is something called a Mott insulator. These are materials that would normally be able to conduct electricity, but are unable to because of interactions among their electrons. Critically, these interactions weaken with elevated temperatures. So, by heating a Mott insulator, it’s possible to turn it into a conductor. In the case of the material used here, NbO2, the heat is supplied by resistance itself. By applying a voltage to the NbO2 in the device, it becomes a resistor, heats up, and, when it reaches a critical temperature, turns into a conductor, allowing current to flow through. But, given the chance to cool off, the device will return to its resistive state. Formally, this behavior is described as a memristor. To get the sort of spiking behavior seen in a neuron, the authors turned to a simplified model of neurons based on the proteins that allow them to transmit electrical signals. When a neuron fires, sodium channels open, allowing ions to rush into a nerve cell, and changing the relative charges inside and outside its membrane. In response to these changes, potassium channels then open, allowing different ions out, and restoring the charge balance. That shuts the whole thing down, and allows various pumps to start restoring the initial ion balance. A future android brain like that of Star Trek’s Commander Data might contain neuristors, multi-circuit components that emulate the firings of human neurons. Neuristors already exist today in labs, in small quantities, and to fuel the quest to boost neuristors’ power and numbers for practical use in brain-like computing, the U.S. Department of Defense has awarded a $7.1 million grant to a research team led by the Georgia Institute of Technology. The researchers will mainly work on new metal oxide materials that buzz electronically at the nanoscale to emulate the way human neural networks buzz with electric potential on a cellular level. But let’s walk expectations back from the distant sci-fi future into the scientific present: The research team is developing its neuristor materials to build an intelligent light sensor, and not some artificial version of the human brain, which would require hundreds of trillions of circuits. But an artificial retina that can learn autonomously appears well within reach of the research team from Georgia Tech and Binghamton University. Despite the term “retina,” the development is not intended as a medical implant, but it could be used in advanced image recognition cameras for national defense and police work. At the same time, it would significantly advance brain-mimicking, or neuromorphic, computing. The research field that takes its cues from what science already does know about how the brain computes to develop exponentially more powerful computing. The retina would be comprised of an array of ultra-compact circuits called neuristors (a word combining “neuron” and “transistor”) that sense light, compute an image out of it and store the image. All three of the functions would occur simultaneously and nearly instantaneously. “The same device senses, computes and stores the image,” Doolittle said. “The device is the sensor, and it’s the processor, and it’s the memory all at the same time.” A neuristor itself is comprised in part of devices called memristors inspired by the way human neurons work. That cuts out loads of processing and memory lag time that are inherent in traditional computing. Take the device you’re reading this article on: Its microprocessor has to tap a separate memory component to get data, then do some processing, tap memory again for more data, process some more, etc. “That back-and-forth from memory to microprocessor has created a bottleneck,” Doolittle said. A neuristor array breaks the bottleneck by emulating the extreme flexibility of biological nervous systems: When a brain computes, it uses a broad set of neural pathways that flash with enormous data. Then, later, to compute the same thing again, it will use quite different neural paths. Traditional computer pathways, by contrast, are hardwired. For example, look at a present-day processor and you’ll see lines etched into it. Those are pathways that computational signals are limited to. The new memristor materials at the heart of the neuristor are not etched, and signals flow through the surface very freely, more like they do through the brain, exponentially increasing the number of possible pathways computation can take. That helps the new intelligent retina compute powerfully and swiftly. The retina’s memory could also store thousands of photos, allowing it to immediately match up what it sees with the saved images. The retina could pinpoint known terror suspects in a crowd, find missing children, or identify enemy aircraft virtually instantaneously, without having to trawl databases to correctly identify what is in the images. Even if you take away the optics, the new neuristor arrays still advance artificial intelligence. Instead of light, a surface of neuristors could absorb massive data streams at once, compute them, store them, and compare them to patterns of other data, immediately. It could even autonomously learn to extrapolate further information, like calculating the third dimension out of data from two dimensions. The research project’s title acronym CEREBRAL may hint at distant dreams of an artificial brain, but what it stands for spells out the present goal in neuromorphic computing: Cross-disciplinary Electronic-ionic Research Enabling Biologically Realistic Autonomous Learning. The intelligent retina’s neuristors are based on novel metal oxide nanotechnology materials, unique to Georgia Tech. They allow computing signals to flow flexibly across pathways that are electronic, which is customary in computing, and at the same time make use of ion motion, which is more commonly know from the way batteries and biological systems work. The new materials have already been created, and they work, but the researchers don’t yet fully understand why. Much of the project is dedicated to examining quantum states in the materials and how those states help create useful electronic-ionic properties. Researchers will view them by bombarding the metal oxides with extremely bright x-ray photons at the recently constructed National Synchrotron Light Source II. Grant sub-awardee Binghamton University is located close by, and Binghamton physicists will run experiments and hone them via theoretical modeling. The neuristors are created mainly by the way the metal oxide materials are grown in the lab, which has advantages over building neuristors in a more wired way. This materials-growing approach is conducive to mass production. Also, though neuristors in general free signals to take multiple pathways, Georgia Tech’s neuristors do it much more flexibly thanks to chemical properties. “We also have a sea of lithium, and it’s like an infinite reservoir of computational ionic fluid,” Doolittle said. The lithium niobite imitates the way ionic fluid bathes biological neurons and allows them to flash with electric potential while signaling. In a neuristor array, the lithium niobite helps computational signaling move in myriad directions. “It’s not like the typical semiconductor material, where you etch a line, and only that line has the computational material,” Doolittle said. Brains are far superior to computers at most things, but not all. Brains recognize objects and do motor tasks much better. But computers are much better at arithmetic and data processing. Neuristor arrays can meld both types of computing, making them biological and algorithmic at once, a bit like Commander Data’s brain. The research is being funded through the U.S. Department of Defense’s Multidisciplinary University Research Initiatives (MURI) Program under grant number FOA: N00014-16-R-FO05. Any opinions, findings, and conclusions or recommendations expressed in this material are those of the authors and do not necessarily reflect the views of those agencies. This entry was posted in electronics, nanotechnology, neuromorphic engineering and tagged (US) National Synchrotron Light Source II. lithium niobite, A scalable neuristor built with Mott memristors, advanced image recognition cameras, Alan Doolittle, android brain, artificial brain, artificial intelligences, artificial retina, Binghamton University, brain-like computing, CEREBRAL, Commander Data’s brain, Cross-disciplinary Electronic-ionic Research Enabling Biologically Realistic Autonomous Learning (CEREBRAL), DOD, Georgia Institute of Technology, Gilberto Medeiros-Ribeiro, human brain, intelligent retina, John Timmer, Matthew D. Pickett, memristor, Mott insulator, national defense, NbO2, neuristor, neuristor array, neuromorphic computing, neuron, police work, R. Stanley Williams, semiconductor material, Star Trek, U.S. Department of Defense on August 24, 2017 by Maryse de la Giroday. Inspired by how mammals see, a new “memristor” computer circuit prototype at the University of Michigan has the potential to process complex data, such as images and video orders of magnitude, faster and with much less power than today’s most advanced systems. Faster image processing could have big implications for autonomous systems such as self-driving cars, says Wei Lu, U-M professor of electrical engineering and computer science. Lu is lead author of a paper on the work published in the current issue of Nature Nanotechnology (“Sparse coding with memristor networks”). Lu’s next-generation computer components use pattern recognition to shortcut the energy-intensive process conventional systems use to dissect images. In this new work, he and his colleagues demonstrate an algorithm that relies on a technique called “sparse coding” to coax their 32-by-32 array of memristors to efficiently analyze and recreate several photos. Memristors are electrical resistors with memory—advanced electronic devices that regulate current based on the history of the voltages applied to them. They can store and process data simultaneously, which makes them a lot more efficient than traditional systems. In a conventional computer, logic and memory functions are located at different parts of the circuit. But like neural networks in a biological brain, networks of memristors can perform many operations at the same time, without having to move data around. As a result, they could enable new platforms that process a vast number of signals in parallel and are capable of advanced machine learning. Memristors are good candidates for deep neural networks, a branch of machine learning, which trains computers to execute processes without being explicitly programmed to do so. Image of a memristor chip Similarly, Lu’s electronic system is designed to detect the patterns very efficiently—and to use as few features as possible to describe the original input. In our brains, different neurons recognize different patterns, Lu says. The researchers trained their system to learn a “dictionary” of images. Trained on a set of grayscale image patterns, their memristor network was able to reconstruct images of famous paintings and photos and other test patterns. If their system can be scaled up, they expect to be able to process and analyze video in real time in a compact system that can be directly integrated with sensors or cameras. The project is titled “Sparse Adaptive Local Learning for Sensing and Analytics.” Other collaborators are Zhengya Zhang and Michael Flynn of the U-M Department of Electrical Engineering and Computer Science, Garrett Kenyon of the Los Alamos National Lab and Christof Teuscher of Portland State University. The work is part of a $6.9 million Unconventional Processing of Signals for Intelligent Data Exploitation project that aims to build a computer chip based on self-organizing, adaptive neural networks. It is funded by the [US] Defense Advanced Research Projects Agency [DARPA]. For the interested, there are a number of postings featuring memristors here (just use ‘memristor’ as your search term in the blog search engine). You might also want to check out ‘neuromorphic engineeering’ and ‘neuromorphic computing’ and ‘artificial brain’. This entry was posted in biomimcry, electronics, nanotechnology and tagged artificial brain, bioinspired, biomimetic, Chao Du, Christof Teuscher, DARPA, Fuxi Cai, Garrett Kenyon, human brain, Los Alamos National Lab, memristor, Michael Flynn, neural networks, neuromorphic computing, neuromorphic engineeering, neurons, next-generation computer components, Patrick M. Sheridan, Portland State University, sparse coding, Sparse coding with memristor networks, Unconventional Processing of Signals for Intelligent Data Exploitation project, University of Michigan, US Defense Advance Research Projects Agency, Wei D. Lu, Wei Lu, Wen Ma, Zhengya Zhang on June 28, 2017 by Maryse de la Giroday.